There is something cool about neon signs. The way they brighten up the night air and make everything glow in white, red, yellow and blue. Neon makes things look modern and retro at the same. 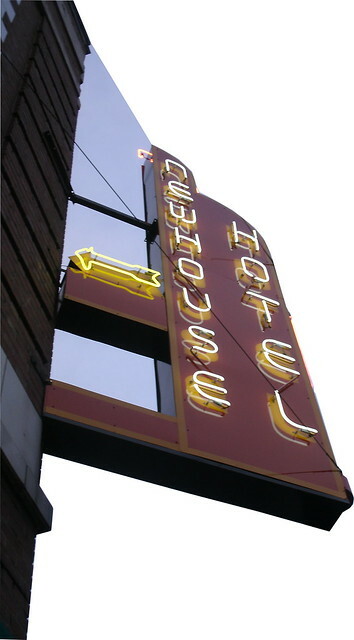 Since Colfax is certainly a kind of wilderness, it’s fitting that on its first block east of the Capitol is a cool new neon sign for our upstairs neighbor, the Newhouse Hotel. The hotel is under new management and they have spiffed up the place a bit. The former sign was decrepit and rusted, often shedding bits of detritus onto the sidewalk in front of our store. The new sign refreshes its retro design with neon highlights. I especially love the little arrow pointing towards the building. The neon sign and the new street lamps on Colfax makes our street feel even more welcoming, charming and full of character. Colfax will always have a bit of grit, but we’re glad to see it being given a nice new coat of cool. This entry was posted in Uncategorized and tagged Capitol Hill Books, Colfax, Neon, Newhouse Hotel, Used Bookstores Denver. Bookmark the permalink.